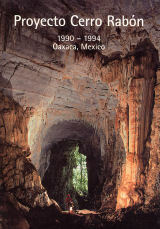 This is a report of the speleological expeditions with cave maps and descriptions including contributions on: Expedition history, forest ecology, ethnography, geography, geology, hydrogeology, karstification, speleogenesis, and archaeology. The massif of Cerro Rabon is situated in south central Mexico (state of Oaxaca) at the eastern margin of the mountain chain of the Sierra Madre Oriental; locally called the Sierra Mazateca. This intensely karstified limestone plateau towers over 2000 meters above the tropical lowlands of the Gulf of Mexico. Systematic exploration of the plateau began in 1985 by a group of American and Swiss cavers. Beginning in 1987, international expeditions have been organized every other year to this date. Yearly investigations into the plateau have grown in scientific dimension as well as physical area.